The other morning the kids were all up early. I was tired and tried to do a simple breakfast by giving the girls granola bars and Wen a bottle. The past few days I had been feeding Wen solids every morning before his bottle. I didn't think it would matter, but he refused to drink his bottle. So I finally took him down to the kitchen and fed him his sweet potatoes. 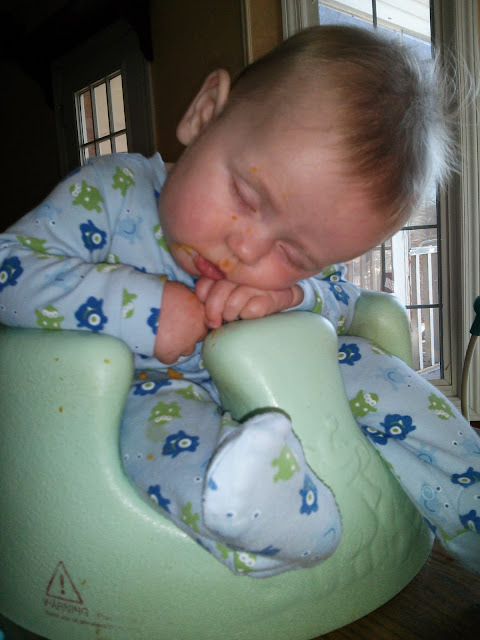 He ate them and as I was by the sink fixing his bottle he promptly fell asleep. Apparently I wasn't the only one who wasn't ready to be up.